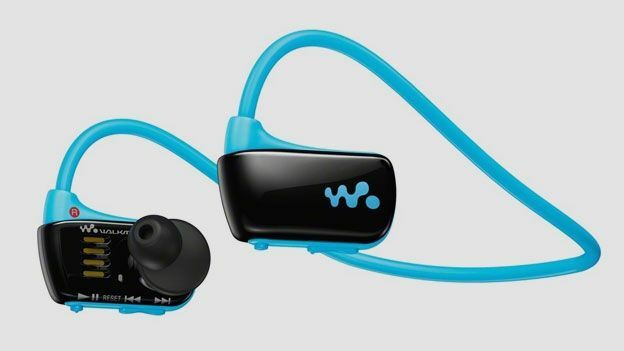 Does the Sony NWZ-W273 Walkman waterproof MP3 player sink or swim? Taking your tunes into the watery depths, the Sony NWZ-W273 waterproof MP3 player is decent enough on land but does it pass the swin test? For runners, riders and gym lovers whipping a phone or MP3 player into the armband and plugging in a pair of headphones capable of withstanding the rigours of a workout is easily done. For those who prefer some aquatic aerobic activity there are slightly fewer options to keep you motivated in the pool. The Speedo Aquabeat 2.0 and Finis SwiMP3 are waterproof MP3 players that have already attempted to solve the music in the water dilemma and now the Sony NWZ-W273 all in one MP3 player setup has the potential to offer the same package in a much sleeker design and a sound that will satisfy even the most ardent audiophiles. Available in glossy black, white, pink and blue Sony has stayed true to the look and feel of previous W-Series MP3 players, building everything into the earpieces with a single connecting flexible rubber neckband all of which is 100% waterproof up to 2 metres. Physical buttons are divided between the earpieces with Play, Skip Tracks, Hold and On switch on the right alongside a battery notification light. On the left you'll find the Volume rocker and the Shuffle songs button where you can also access stored playlists. Also in the box are two sets of ear buds, an adjustment band to tighten the fit around the back of the neck and a small USB charging dock cradle where you clip the MP3 player into. Disappointingly, there is no way to connect a USB directly to the device which means you are relying on not losing that little cradle. At 29g it's roughly double the weight of an iPod Shuffle and once you've have pulled them on they're barely noticeable. The flexible neckband does not cause any irritation while the earbuds which can be replaced with large or small sizes fit perfectly snug inside the ear and are secure at least when it comes to wearing them out of the pool. 100% waterproof they may well be but that does not mean you can test them outside the confines of your local swimming pool as they're not made to be used in saltwater so these are not much use at the beach. It does mean that they're built to guard against moisture like sweat and rain and with just the neckband as the only wire there's no need to worry about getting them tangled within themselves when they end up at the bottom of your bag. Closed dynamic 13.5mm drivers are the main reason that they provide the kind of audio that is superior to other waterproof MP3 players we've tested out including the Aquabeat 2.0. They excelled in terms of loudness and clarity with high trebles but it lacked the punchy bass that it promised. They do a brilliant noise cancelling job blocking out exterior noise leaving you to focus on the swim and when outdoors allows for ambient noise which is ideal if you are running out in busy areas. The key selling point of this is MP3 player is being able to take them for a swim so we headed for the pool to try them out first. Putting them in was a fiddly affair, working out whether to put the goggles and swimming cap first and then the headphones, or whether it was the other way around. Eventually after several minutes of fiddling about we got them secure and in place, using the adjustment band to make sure that there was no chance of them budging. During the first ten minutes of swimming the sound performance was impressive and earpieces stayed in place but then it all quickly changed. When we turned to make a lap of the pool one of the buds popped out and despite swiftly putting it back in had now stopped producing any sound transferring it to the other earpiece. Just minutes later the sound began to quieten and even our attempts to turn it up had no effect. On further testing the audio had been adversely affected and no longer delivered what was initially really great audio. Out of the pool and in the gym our outdoors, the Walkman offered a secure and unobtrusive way to listen to music but the audio simply is not comparable to other sports headphones that we have tested. It was all so promising for the Sony NWZ-W273 Walkman MP3 player but ultimately it failed to impress in the area that it talked up the most. It ticked the important comfort box and was secure enough to wear running or in the gym without worrying if they would fall out. The battery life is also great and with the addition of a three minute quick charge which gives you 60 minutes of playback it's perfect for those who often have enough tech to remember to charge the night before. It simply did not cut it in the pool having tested them several times over a week to give it the benefit of the doubt. Once the earpieces got loose the sound was severely affected leaving you wanting to toss them to the side and carry on swimming without them. Decent as they are to use in drier surroundings or out for a run, these are best kept out of watery depths.